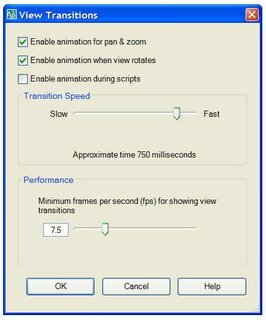 Enable Animation for Pan and Zoom. Makes a smooth view transition during panning and zooming. Enable Animation When View Rotates. Makes a smooth view transition when the view angle is changed. Enable Animation During Scripts. Makes a smooth view transition while a script is running. Set the transition speed by moving the slider. 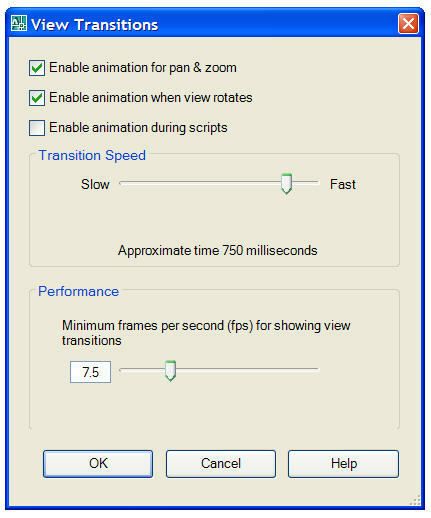 To preserve performance, set the minimum frames per second for showing smooth view transitions. When a smooth view transition cannot maintain this speed, an instant transition is used.